Stylographs were a rather interesting variation on writing instruments that appeared around the start of the 20th century. The advent of the technical capability to produce very small metal components (such as microscopic tubes and very thin wire) made it possible to make the stylograph a reality. It was initially thought that this design would replace the fountain pen, but in a rather short time it became clear that they did not have the writing facility that fountain pens have. However, they did find a very important niche in drawing/drafting and helped to revolutionize the industrial machine (draftsmen could create all kinds of highly detailed technical drawings). I first discoverd technical pens when I was in high school. At that time Koh-i-noor was the well known brand name and I acquired a set of their stylographs. They were cartridge fillers, where you would use a special squeeze bottle to refill the cartridge when it ran dry. But one day I came across an older version in an art store. It was much more visually appealing, with its streamlined and tapered shiny black body. The integrated piston filling mechanism felt superior to me over the cartridge filler. However, the drawback was that you couldn't see how much ink was left in the pen. I bought it anyway and kept it in my arsenal of stylographs. Years later, the advent of eBay exposed me to a plethora of the older Kohinoor stylographs, which I added to my collection. But one day I came across an oddly named version of this stylograph, called a "Tintenkuli". It was in rather bad shape, but I was shocked at how high the auction closed on it. It seemed absurd, compared to the $10 going rate for the Kohinoor model of the same design. Why was there such an interest? I would eventually come to find out, much to the dismay of my wallet! This discovery sent me down a path of acquiring a wide range of these older stylographs. But beyond their historical significance, many of them are quite beautiful to behold. And so, my collection began, all thanks to a man by the name of Dr. Wilhelm Riepe. In 1920, a German man by the name of Dr. Wilhelm Riepe became acquainted with the stylographic pen while visiting America. He noticed that instead of a nib, the tip of the pen had a small metal tube with a thin wire running within it. The wire would guide a gradual flow of ink out of the tube, producing a nicely consistent fine line. The wire was attached to a counter weight that would close off the ink flow when pointing the pen downward--pressing on the tip onto paper forced the wire to push the weight up, creating a gap that allowed the ink to flow. This was not a known writing instrument in Europe, so Dr. Riepe took one with him when he returned home to Germany. After giving it away to a relative, word got around and soon he was receiving requests for more. Since Dr. Riepe was involved with the manufacturing of medical instruments, he decided to try making his own stylograph. He managed to succeed in creating a replica, and even improved upon the original one he had obtained in America. The pen very well received. Dr. Riepe decided that he would need to mass produce this stylograph, so in 1928 he founded the Tintenkuli Handels GmbH factory based in Hamburg. His company produced innovative stylographic pens that featured a piston filling mechanism, an ink window, a well balanced ink feeding mechanism, and easily interchanged stylographic writing tips. The success of the pen grew and export surged to approximately 30 countries. 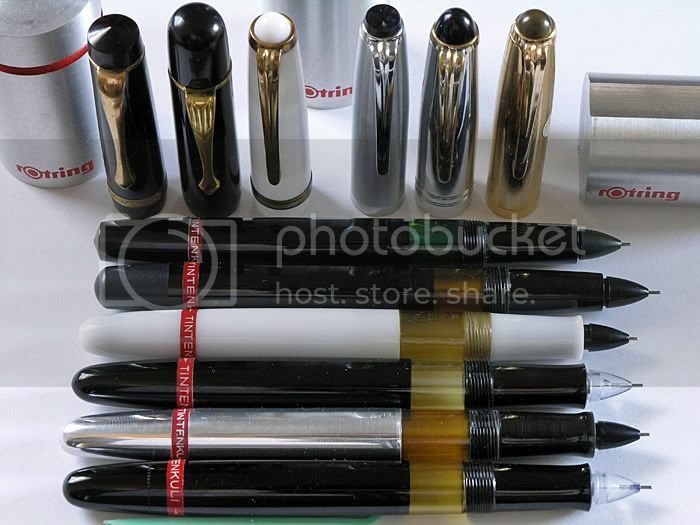 The name chosen for the pen, "Tintenkuli", is the combination of "Tinten" (ink) and "Kuli" (worker). Thus, "ink worker". At that time in history, it was common to refer to a manual laborer from China or India as a "Coolie" or "Kuli", which could be taken as a racial slur. Thus, Dr. Wilhelm decided that the Tintenkuli pens were later referred to as "Tiku" pens (first two letters of each word), to be more politically correct. Eventually the slur was forgotten (thankfully!) and in Germany, "kuli" is now a synonym "ballpoint". The original Tintenkuli was made of black hard rubber/plastic all-throughout (the only color was provided by the signature red ring). 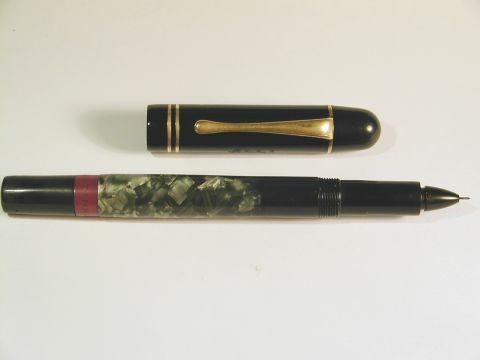 The beauty of celluloid patterns used in fountain pens in those days caught the eye of Dr. Riepe, and so a number of models were made in celluloid with a variety of colors (red, green, blue, and gray) and patterns (marbled and "candy striped"). There were also some demonstrator models (completely clear bodies) made in later production years. The very first Tintenkuli was a lever filler, but soon after a piston filling mechanism was developed. The piston was activated by turning the bottom section of the pen, but this was eventually replaced by a textured knob hidden by a blind cap (a design that was much easier to service). The internal piston screw mechanism had only two subtle design variations, the last one utilizing a plastic plunger instead of a cork seal. The first celluloid Tintenkuli had a large rounded black cap top, which was later replaced by a semi-conical pointed cap, then finally with a small "streamlined" black dome. In all cases, the cap tops were used to secure the clip to the cap. Cap bands were either absent, single thick band, two or three thin bands, or a thick band surrounded by two thin bands (there was even a rare version with a raised Greek geometric pattern on the cap band). Clips also varied from year to year, with some curved and others straight with lined patterns. Some models had steel caps (similar to the Parker 51 lustralloy cap) and even a rolled gold cap with lined pattern. The interchangeable stylo tips varied slightly in design (cone, short dome, long dome, and even a clear dome) and initially they all had the same sized tip (equivalent to a fountain pen medium nib). The very end of the tips were slightly rounded, so that the pen would write smoothly for every day use. Eventually it was clear that smaller tip sizes appealed to various professionals using technical pens, so a "spezial" (or "special") version was released with different sized stylo tips provided. These had less rounded tips, for greater drawing precision. One of the key innovations with the Spezial, is that the stylo tip base was squared-off so that removal could be easily performed with a nib key (the previous smooth rounded surface did not afford a good grip). The usage of clear tips came and went, then later reappeared. The initial advantage seemed to be the revealing of ink flow, but clear material would become stained by some inks and look unsightly. It may be that improvements in the material resulted in their return later on by Koh-i-noor. In addition to the stylograph, Dr. Riepe introduced the first rollerball pen, aptly named the "Roll-kuli" (the precursor to the ballpoint). There was also the "Blei-kuli" (mechanical lead pencil), the "Tikk-kuli" (ballpoint pen--'tikk' is for the sound the ballpoint makes when activated), and a "Farb-kuli" (multi-color mechanical pencil). The Roll-kuli had two tip configurations--straight and angled. It was thought that the angled one would more appropriately suit the writing position of the hand. At some point, Rotring made a clear Roll-kuli tip (very rare). To help make his pen distinctive, Dr. Riepe had incorporated a small red ring near the base of the pen (just above the blind cap). It would be duly noted on the pen boxes that this is the stylograph "mit rotring", which means 'with red ring'. The trade name "Rotring" was secured around 1950, and by 1953 the Rotring Rapidograph became the quintessential technical drawing pen of its time. 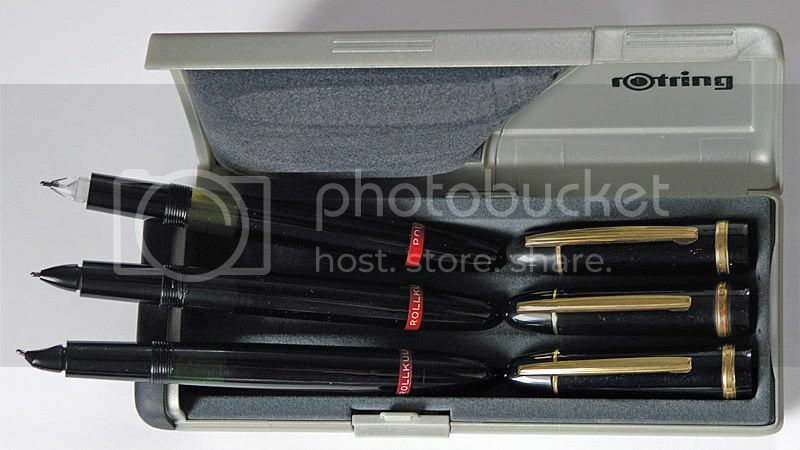 By the early 1970's, the Tintenkuli company name was officially dropped and succeeded by "Rotring-Werke Riepe KG". Apparently for some period of time, pen production was performed in Argentina. The craftsmen there introduced some unique variations that were never produced in Germany (such as pen bodies made completely of aluminum, white celluloid, or clear plastic). As Rotring sought to establish a strong presence in the USA, it partnered with the Koh-i-noor pencil company in Bloomsbury NJ (the original Kohinoor company was founded in the Czech Republic in 1790). Stylographs distributed by Koh-i-noor in NJ were branded as "Koh-i-noor" Rapidograph pens, and the red ring was changed to brown with "koh-i-noor" embedded on the cap clip. "Made in Germany" was imprinted on the cap side, with a subtle presence (no ink was filled into the lettering). They were made in four different sizes (0, 1, 2, and 3). 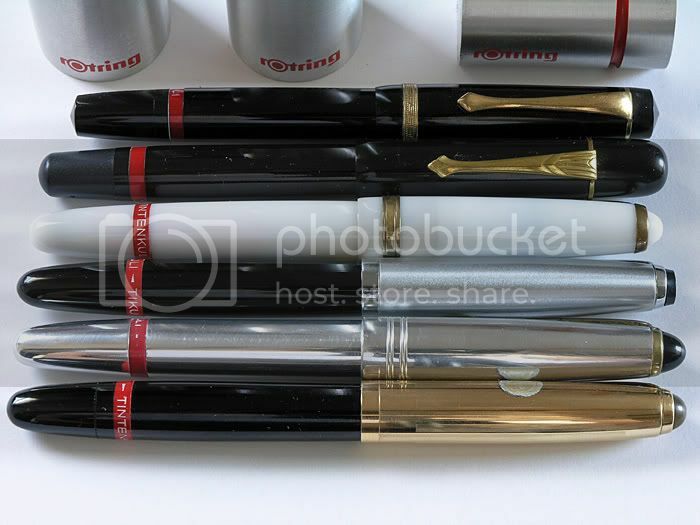 Rotring continued to make the Tintenkuli for Germany, but made a few changes--the word "Rapidograph" now appeared in place of "Tintenkuli" on the red ring, and the ink window was removed to cut production costs. Also the streamline design was phased out in favor of a more squared off design. 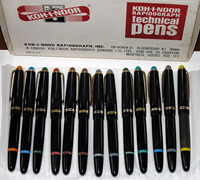 Some years later, the Kohinoor branded stylographs reverted back to the earlier streamline design that Rotring had made, as a wide color scheme was devised to represent each stylographic tip size and the original small black dome seemed ideal to colorize (approximately 11 different colors were used). Exactly why Rotring diverged the Kohinoor brand in stylographic pen design is not quite clear. I haven't been able to find much information about the relationship between the two companies. 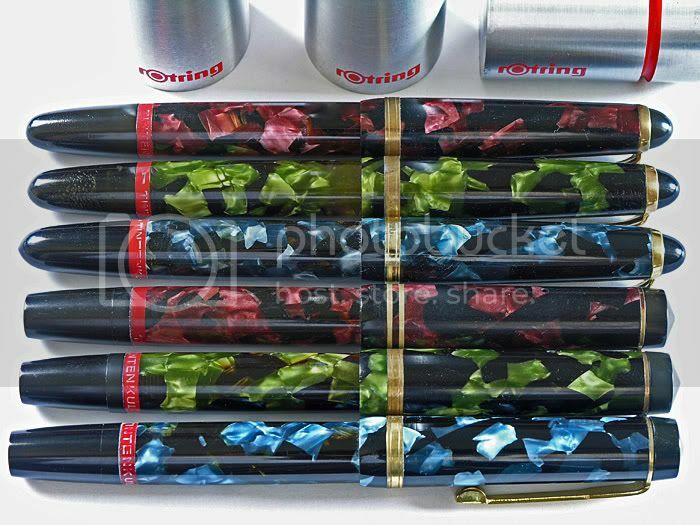 It appeared as though Kohinoor had contracted with Rotring to make stylographs with their name for the USA, but eventually Rotring began selling "Rotring" branded stylographs in the USA in the late 1970's or early 1980's. It seems strange for Rotring to compete with the Kohinoor brand, as there were other competitors vying for business in the USA (such as Mars-Staedtler and Faber-Castell). Or, it may be that the two brands were targeting different buyers--Kohinoor stylographs used manually filled cartridges while Rotring styographs used disposable cartridges (handy for field work). At some point, Koh-i-noor may have stopped importing stylographs from Rotring and started manufacturing them in the USA, but I can't confirm that yet. Tips were either steel, jeweled, or plastic (size 6 and up). In any case, by the early 1990's, CAD (computer-aided design) quickly began replacing the technical drawing pen. Rotring moved fast to counteract this and diversified into a greater range of modern pencils, markers, and rollerballs. At some point, Rotring brought back the general writing stylograph with the introduction of the Rotring Altro. But by the late 1990's, the consolidation of writing instrument companies eventually reached Rotring, as it was acquired by Sanford. 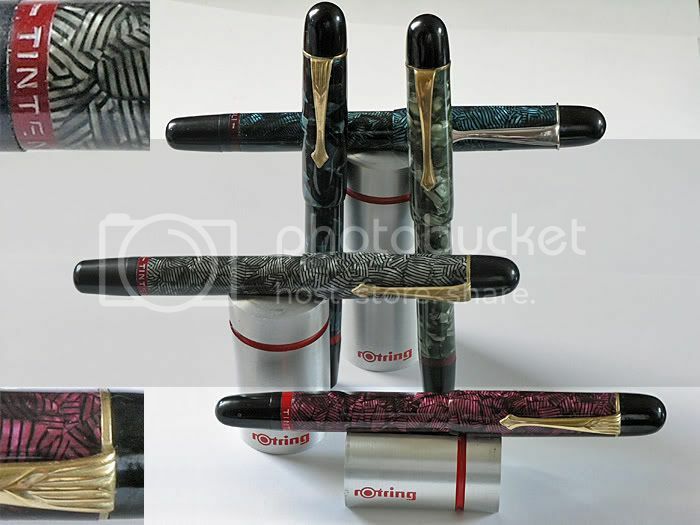 Before the acquisition was complete, Rotring managed to release one last pen under it's namesake--the Limited Edition Rotring Tintenkuli. This was a very large version of an iconic early model of the Tintenkuli stylograph, with a feature of interchangeable stylo tip and standard nib. In honor of the founding date of Dr. Riepe's company, only 1928 pens were produced. Under the Sanford/Rubbermaid-Newell brand, Rotring no longer produces stylographic pens for the USA. In fact, it seems that Sanford might be planning to phase the brand out altogether. You cannot find Rotring among their "prominent" brands list on the company website. It may be possible that Rotring is continuing on in Europe, though. The Mars-Staedtler company (which was founded in 1835) now appears to be the most prominent maker of stylographs today. Koh-i-noor no longer has a physical presence in the USA, but in 1999 European Koh-i-noor completed an internal restructuralization of manufacturing and sales in the Czech Republic. ChartPak is the sole distributor of Koh-i-noor stylographs for the USA. So there you have it--a "brief" history of the Rotring Tintenkuli stylographs. I hope you enjoyed it. As for comparing the stylograph to a fountain pen, I've actually been impressed with what a well maintained stylograph can do. Also, they present a very wide range of line sizes through interchangeable tips. However, there is no line variation possible, which is something often appreciated with a fountain pen. But for drawing purposes, it would be interesting to show a comparison between the two types of writing instruments. If only I could draw well enough to show people. SIDE NOTE: Do I have a stylograph that belonged to one of your relatives? On April 20th 1953, R. Priestnall received a stylograph while visiting Madame Lefevre at the Alexandra Lodge, Tiverton Devon England. He wrote "Bought in Liege with Madame Lefebvre. She gave it to me." It's a blue marbled stylograph with conical end points. On the sides of the box, R. Priestnall wrote all of those details. Liege is in Belgium, which I guess is where Madame Lefevre was from. Edited by MYU, 20 May 2007 - 05:52. I added a few minor corrections. I'd be interested in any feedback for information missing or incorrect. I do realize that I put some historical info in there that is a bit "dry", so I may edit that out and convert this into more of a review. Even include some better photos and some macro shots of the materials, to give a better idea of how they look. Edited by MYU, 30 April 2007 - 00:01. This is fascinating! Thanks for your research and illuminating presentation. Wow, thanks for the hard work! I've been researching this for a while (coming from the Koh-i-noor end of things) and you've collected more data than I could find. You've also got an astounding collection of pens. 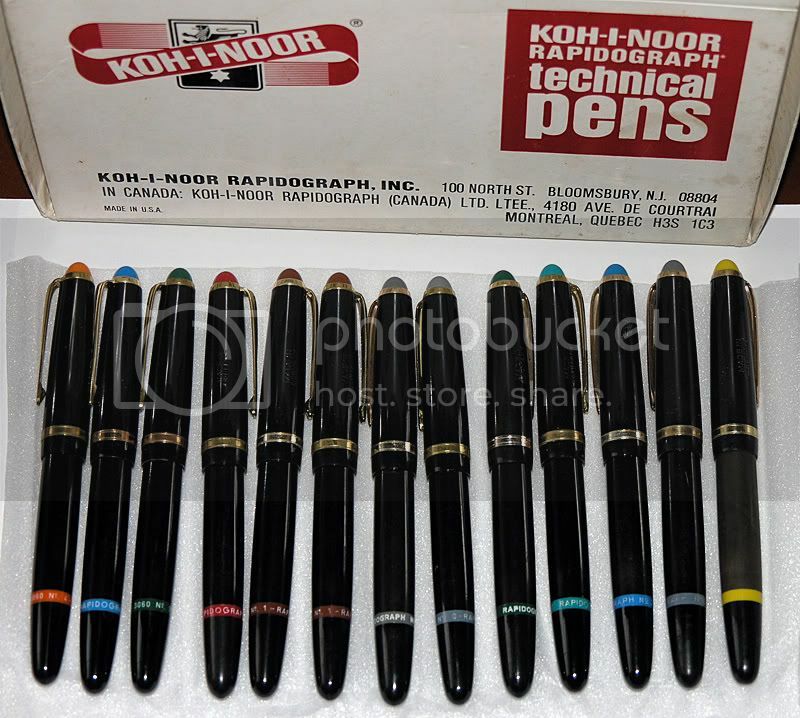 As for the Koh-i-noor Rapidographs, I believe there were 11 color-coded sizes at one time. Some of the sizes (like lavender, 0.18) are very hard to find and thus were probably not made for long. Early versions had a clear ink-view window and a non-color-coded cap. There was also a variant called "Acetograph" made for writing on acetate films, presumably with a harder tip. These are identical to the color-coded piston fillers but with silver trim instead of gold. The Koh-i-noor piston fillers have hard rubber barrels with attached (not removable) gripping sections. The blind cap and cap are plastic. There are at least two variations of the internal piston mechanism. They were replaced by the cartridge-filled Rapidographs some time in the 70s, first with a black version with a hexagonal barrel and metal trim, then with the modern version in the 80s, which added a metal clip on the cap and was a bit longer. The new version usually had the now-familiar white barrels but black and dark red versions were produced. The modern ones are available in 9 sizes, from 0.13 (6x0, turquoise) on up. As far as I've been able to figure out, they concurrently sold the Koh-i-noor Rapidographs and the Rotring Rapidographs in the US because they each had advantages: Koh-i-noor versions used a refillable cartridge and could be filled cheaply from bottles of ink, while the Rotring version used a disposable combined feed/ink cartridge that was easier to replace and had the benefit of unclogging the pen. According to an Art teacher I talked to who used to do promotional work for Koh-i-noor, the Rotring ones were considered more portable for use in the field. As far as I'm aware these Rotrings are still sold in the US - at least a few distributors still have them. The Rotring Rapidographs sold in the US were all the disposable-cartridge type, but I've seen European versions that used a refillable cartridge system like the Koh-i-noor. Chartpak currently sells individual Koh-i-noor Rapidographs or sets of 7 sizes. I find the modern versions inferior in every way to the old Koh-i-noor piston fillers: Their ergonomics is horrible, they're difficult to start, and they look cheap. The piston-fillers, by contrast, are good looking, start instantly because the ink is imbibed through the tip, and have a nice ergonomic gripping section. They also hold a ton of ink, not always a good thing because they leak about as often as the new versions. The replacement tips sold for the new pens fit just fine in the old piston-fillers, although they don't look as good. There was also the Rotring Rapidoliner, a much-loved cheap version with a cartridge that included ink resevoir, feed, and a new tip. These were discontinued a few years back and are selling for ridiculous prices when you can find them. P. S. By posting those beautiful pictures of celluloid Tintenkulis you've started me on a lifelong quest that will probably bankrupt me. I hope you're happy. You're welcome! I started this collection about 4 years ago, with very little knowledge about what was behind it. The Internet provided most of what I know, so I'm not 100% certain I've gotten everything accurate. There's been a relatively small group of people collecting these pens, from all over the world. Many of them I've bought from German sellers on eBay, but sometimes you find them being offered from other European countries like France and Switzerland. Thanks for adding your details on what you've found out about stylographs. I didn't realize that Rotring used disposable cartridges in their pens. It makes sense, though. The piston filling mechanism is more expensive to produce, so it seemed that sometime in the 70's they all abandoned it (to keep costs down). 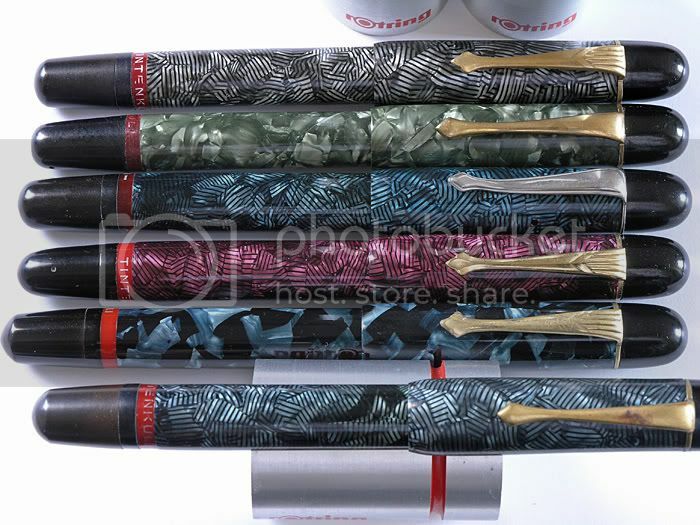 You're right -- Rotring made 9 different nib sizes, while Kohinoor had more. Actually, even more than 11. I've added this to the original post. Great review of an entire range of pens! I learned more in 20 minutes of reading than I ever knew about stylographs. 18 sizes? Apparently my collection of Koh-i-noor piston fillers is not as complete as I thought. Some of them must have been made for a very short time. I believe I have one set of instructions showing 7 sizes and one showing 11. The other sizes were probably made near the switchover to cartridge-fillers. 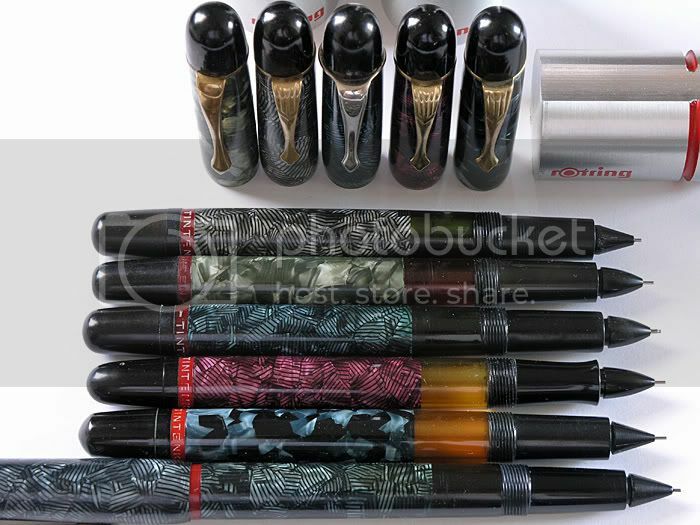 thanks for your excellent work on Tintenkuli pens. I have a small collection of these pens too, although I must say that I admire yours . However, I collect for only a year now so there is still some hope.... Currently, I have five Tintenkulis in daily use. They are reliable companions as they should be. They write smooth without problems. I attach an image of one of them. This is a version not shown by you (the back end is the turning knob, not a blind cap). The pen came to me without a cap (via e-bay of course). The cap shown is from a defective 1930's Tintenkuli and it fits quite well. I don't know the time of production of this pen. Due to the cork seal and the overall appearance I would place it into the 1930's, but any information would be appreciated. 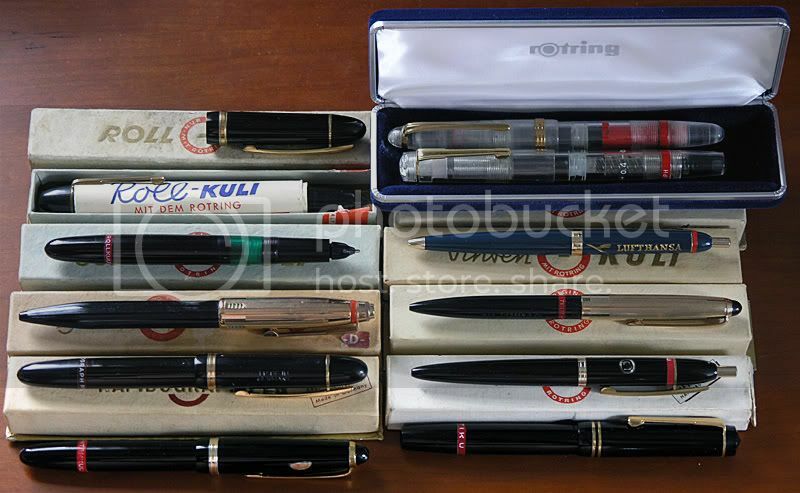 - The first pens advertised as Tintenkulis were not piston-fillers and in design rather similar the american stylographic pens. You mightt want to check out this link: Early Tintekulis . Tom Westerich has images and information about a couple of other Tintenkulis, maybe this is helpful for you too: Under www.penboard.de/shop/ click Database, then Rotring. There is also an e-bay auction currently running for an 1929 advertisement showing one of the old pens : e-bay auction on Tintenkuli ad. Production of piston-filler started somewhat later, however, I don't know when. - Tintenkulis were intended for general writing. Therefore, they have rounded tips and generally not a well defined line width. The Rapidograph pens, however, were only intended for technical drawing. The Rapidograph tip was therefore a straight tube which allowed the drawing of lines with well defined width (and had to be held vertically). After reading your article, I thought this important fact was not pointed out very clearly. Tintenkulis and Rapidographs were therefore produced parallel for some time, although the Rapidographs for much longer. 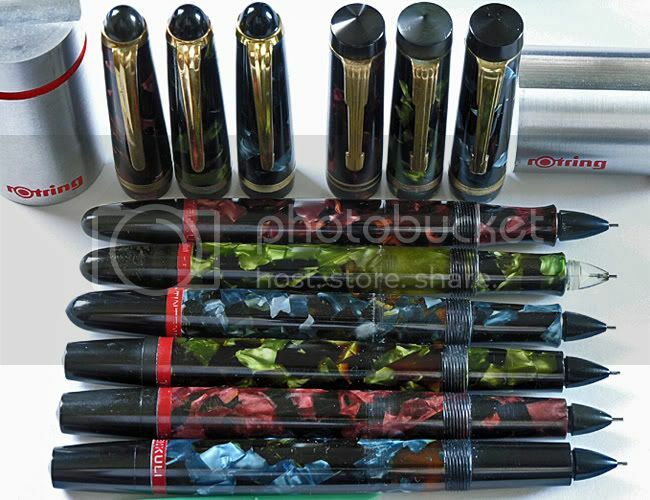 - Long after stopping the production of Tintenkulis, Rotring went back to stylographic pens for general writing with the Rotring Altro, a comparably cheap cartridge pen. This pen was produced into the 90ies to my knowledge. - The word "Kuli" in todays german language is a synonym for Ballpoint-pen (german: "Kugelschreiber"). This comes most probably from the ease of use and reliability associated with both instruemnts. However, nobody would call a technical drawing pen a Kuli. Thanks, Dan -- I aim to please! Mmoncur, I was surprised myself. I'll have to post a photo of the Koh-i-noor display box I have, showing the 18. There are definitely some that are quite uncommon now. I've only seen a few 6, 7, and 8's, and nothing above that. It could be for that large line thickness, people would use other implements. I'll also post photos of what I have. It's strange how Koh-i-noor changed from the metal tip to a full translucent plastic one after size 4. I'm embarrassed to say this, but I've never tried inking one of them to see how they write. I should try one and see how it works. The first pens advertised as Tintenkulis were not piston-fillers and in design rather similar the american stylographic pens. Tintenkulis were intended for general writing. Therefore, they have rounded tips and generally not a well defined line width. The word "Kuli" in todays german language is a synonym for Ballpoint-pen (german: "Kugelschreiber"). This comes most probably from the ease of use and reliability associated with both instruments. However, nobody would call a technical drawing pen a Kuli. Very interesting! I was told it meant the pen genus, but I just did a search on eBay and I see more ballpoints coming up using the "Kuli" keyword. What is the German word generally used for a technical pen these days? Joerg, regarding your posted picture, I have one of these with the original cap! It came in a rather rough leather pouch too. I can't remember the brand name off the top of my head, but it was something like Hanson 360. On the red band, it has "Tintenkuli" etched on it in very tall letters (unlike the small letters on the Rotring models). In your case, you appear to have a Rotring stylo tip on it too. I'll have to pull out mine and photograph it. Edited by MYU, 02 May 2007 - 14:25. Often a technical pen is named "Tuschefüller" or "Tuschestift" . Tusche = indian ink, füller= short form of Füllfederhalter, the german word for fountain pen, stift = pen. Here's a picture of the pen I have. I didn't remember until I saw it that it doesn't have the stylographic tip--it was replaced with a nib. I think this pen had them interchangeable. In any case, the cap can be seen, as well as the bold "TINTENKULI" on the red ring. The person I bought it from (in Germany) said it is a "Hanson" and the model number 390. I'll try to take a better picture (this one was done at night). Thanks for the picture. I find it very interesting that the pen doesn´t have a straight nib section like the other old Tintenkulis. Is is possible to exchange the nib against the stylographic tip? Hi Joerg, I noticed that curved section as well. I'm not quite sure if the nib is interchangeable--I will have to give a closer inspection. Have you ever seen a vintage German pen with the word/name "Tintenkuli" on it having a standard nib? I had thought that Tintenkuli was meant for stylographic pens. If that is indeed the case, then either this model has an intentional selection of nibs *and* stylo tips, or someone managed to fashion/find a 3rd party nib that somehow fits this pen. Either way, very curious. What struck me rather interesting about your particular pen, is the squared off integrated piston screw bottom with a relatively thick red ring. Both of our pens share this. However, I believe yours has "tintenkuli" in small lettering, whereas mine is more like "TINTENKULI". Clearly, the rest of the pen is different, most notably the stylo tip instead of nib, marbling of the celluloid, and the straight versus curved section. It could be the same maker, but just different models and years made. 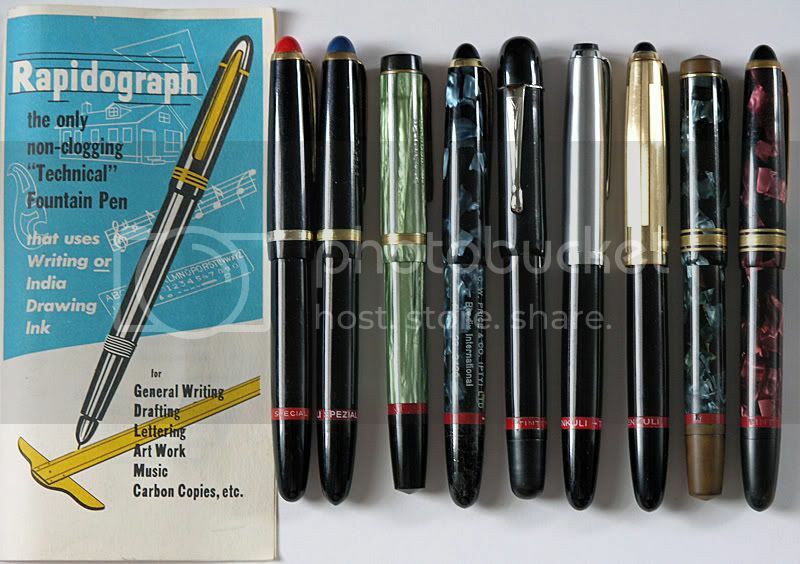 Perhaps it was a smallish company that first tried to imitate Rotring stylographs (the red ring is a complete rip-off), and then used the basic same pen for nibbed pens (to the point where they didn't even change the name "Tintenkuli"). Edited by MYU, 11 May 2007 - 23:36.
shape and style of the cap as well as the material look very similar to another Tintenkuli I own. But that might be said about a lot of other pens made in the 1930ies. I have not seen another pen named Tintenkuli having a conventional nib. But given the screw-in mechanism for the nib it seems obvious that you can add a nib very easily. A more obvious explanation for me would be that yours it is either a Franken-pen, because the piston filler just fitted well or that it was an attempt to use the well established brand name Tintenkuli also for standard nibbed pens. Who knows. This has been a terrific read for me; I just inherited an old(er) Kooh-I-Noor Rapidograph with a 0 (0.35mm) tip. Works well, and I love the fine line, but as it requires a nearly vertical position for writing, it doesn't work for me as well as I'd like to for daily writing or marginalia. Are there Tintenkuli-style tips available for these newer Rapidographs? If so, where? Hi Rroossinck - yes, your Koh-i-noor is a technical drawing pen. These are not well suited to everyday writing, but more for technical drawings. A stylograph (unlike a rapidograph) has rounded edges on the small metal writing tip, which is great for writing (but not precise enough for technical drawing). Unfortunately, the older stylographic tips do not fit in these Koh-i-noor pens and I'm not aware of any stylographic writing tips that were made specifically for Koh-i-noor pens. If you are really interested in having a stylograph, then you may want to look into purchasing an older stylograph. I wouldn't get the "Inkograph" or "Universal" stylographs, as they are rather crude. Tintenkulis are the best, IMHO. Edited by MYU, 06 July 2007 - 16:02. What does a typical user-grade stylograph end up selling for, assuming that you can find one? Whaddya know? This review has become quite the seminal work! It's quoted in an eBay auction! Edited by MYU, 01 October 2007 - 23:47. Because I can't edit my original posting, you can now find this review on Googlepages. Google Pages seems to be a pretty good personal website host. The editors are easy to work with.